Fidget spinners may have been banned in school, but they were a hit at the Girls In Technology summer academy, where girls from fifth through eighth grades worked with basic 3D modeling software and 3D printers to design and build their own fidget spinners. Their designs included everything from geometric shapes to animals like cats and dogs. "They're really unique and most people think it's really hard to make, but it's actually easier than they might think," explained Sanaa, a rising sixth grader at the camp. The fidget spinner project was just one lesson from the two week camp, where the girls also learned how to make speakers, solder electrical connections, program robots and work with equipment like the 3D printers. "I never knew about a 3D printer until quite recently, so it's cool to be using it and creating my own things," said Leena, who will also be in sixth grade next year. The camp was coordinated by curriculum supervisors Maria Wileczek and Sergio Anaya and taught mainly by Plymouth Whitemarsh High School teachers who the girls could have again when they take STEAM-related courses -- like art, engineering or computer programming -- at the high school. "I'm excited, because I actually want to be an aerospace engineer when I'm older," Jaclyn, a rising seventh grader said about the Girls In Technology program. "It can help me and inspire me to do other things when I'm in high school and in college." The program also brought in guest presenters to share their insights with the girls. 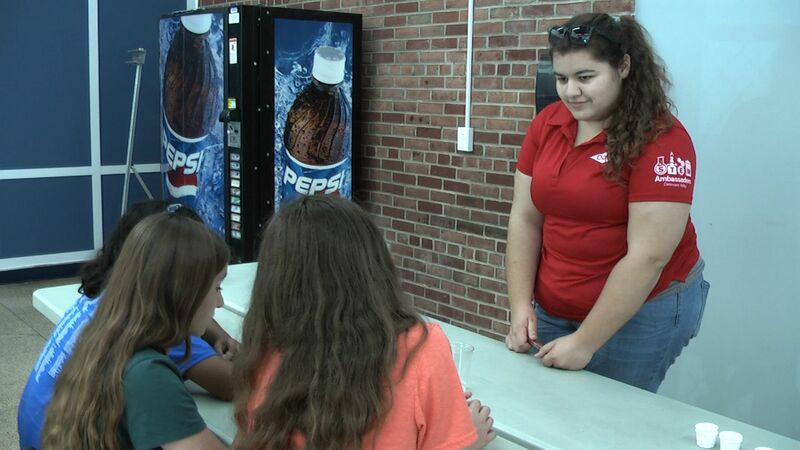 Three female Dow STEM Ambassadors from Dow Chemical Company in Collegeville spent the afternoon talking about their jobs and leading the campers in experiments in chemical and mechanical engineering. "It's exciting to meet women who have jobs in STEM and to do these activities, which could lead to possible career options like their careers," said a middle schooler named Madeline. Kaitlyn Blair, a Dow STEM Ambassador, noted that she was the first person in her family to pursue science and really didn't have any role models she could follow when she was in school. "I definitely like to give girls that kind of leadership persona that I never got," explained Ms. Blair. "So I like to get involved with getting girls interested in science, because I know that I would have definitely appreciated having something like that growing up." While fidget spinners have been getting a bad reputation in schools for being a distraction, the 3D modeling project and other activities during the camp gave the students in the Girls In Technology summer academy a solid foundation that may inspire them to take STEAM electives at the middle school and high school and to pursue high-paying STEAM careers in fields that have largely been dominated by men. "Some people still think that girls can't do certain things or there's boy things and girl things," said Samantha, who'll be going into sixth grade in the fall and is interested in being an engineer. "I think it's important for girls to be in technology so they can inspire other girls to do different 'boy jobs' that people usually think are [only for boys]. And I think it opens up a lot of opportunities for women." The Girls In Technology summer academy takes place each year in June.